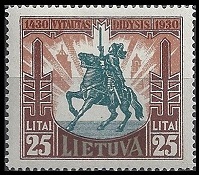 The first Lithuania stamps were produced in December 1918. The postal service of the Post-World-War I republic required new definitive postage stamps, so perforated type-set sheets of twenty stamps were quickly produced in Vilnius and Kaunas. The first Vilnius printings are shown in the image above. Properly produced and much more attractive definitive Lithuania stamps would appear during 1919. 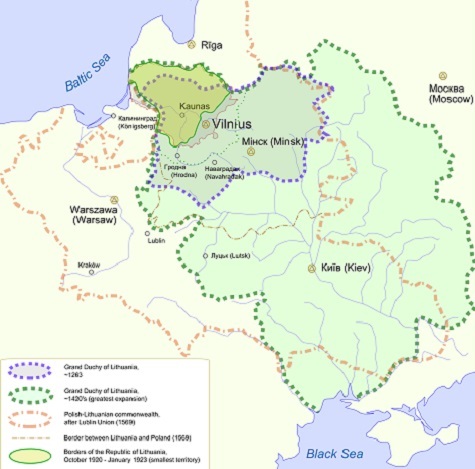 During the 14th Century, the Grand Duchy of Lithuania was the largest country in Europe, stretching from the Baltic Sea to the Black Sea, encompassing the present-day countries of Lithuania, Belarus, Ukraine, and parts of Poland and Russia. The Polish-Lithuanian Commonwealth was created in 1569, and this unified state dominated Eastern Europe for two centuries, when it was dismantled and annexed by the Russian Empire. Following the Russian Revolution, in 1918, Lithuania declared its independence. However, the new Lithuanian republic was very short-lived. By the terms of the Molotov-Ribbentrop Pact of 1939, the Republic of Lithuania was awarded to the USSR. During World War II, Lithuania was occupied by the army of the USSR (1940), the German army (1941), and then again by the army of the USSR (1944). In 1945, the former Republic of Lithuania became the Lithuanian Soviet Socialist Republic. When the Soviet Union collapsed at the end of the 20th Century, Lithuania again became an independent republic, and it is now a prosperous member of the European Union. The national symbol of Lithuania, referred to as the Vytis or White Knight, features a mounted knight on horseback. This White Knight was the heraldic symbol of the Grand Dukes of Lithuania, and it represents Lithuania driving away invaders. The most famous of the Grand Dukes of Lithuania was Grand Duke Vytautas (1350-1430), the national hero of the Lithuanians. Both the White Knight and the image of Grand Duke Vytautas have appeared on a very large number of the postage stamps of Lithuania. The definitive and commemorative postage stamps of Lithuania showcase much of the impressive thousand year history of this proud Baltic nation. 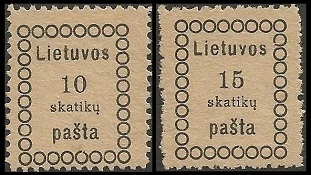 Links to historical articles and reviews of many of the postage stamps of Lithuania will eventually appear at the top of the third column of this page.